It is official – Channel 4 are to broadcast Formula 1 from the 2016 season. The BBC have exited their portion of the contract three years early. Channel 4 will broadcast races advert free, with 10 races live and all 21 races broadcast again in highlights form. Their deal also covers practice and qualifying, so like-for-like with the current BBC F1 contract. Their deal will expire at the end of the 2018 season, whilst Sky Sports’ portion of the contract remains unaffected. The ten point plan that Channel 4 proposed in Summer 2011 to try and capture exclusive UK F1 rights. The major surprise is that it is Channel 4 replacing BBC’s TV coverage and not ITV, as was reported last week. On his BBC Radio breakfast show on November 24th, Chris Evans noted that Channel 4 were likely to take over, so Evans was spot on the money. Before we get into what Channel 4 could and could not do, first we need to investigate why not ITV. I have reached out to them to find out if they were approached at all, and will update the site when I get a response. ITV were odds on favourite, so either the broadsheets last week were wrong, or the deal fell through at the eleventh hour. The Euro 2016 picks last Monday left the door open for ITV to broadcast Formula 1. Channel 4’s release states that races will be shown commercial free. Were ITV unwilling to comply with that, and therefore lost out? ITV announced a Top Gear rival last week called Driven, which looks odd now given that they failed to secure the F1. There could be a bigger game for ITV with the horse racing rights. If ITV believe horse racing is a better prospect than Formula 1, that’s a thoroughly depressing thought, although the cost of horse racing rights would be lower than Formula 1. From a reach perspective, ITV wins out, but Channel 4 skews younger than ITV. Formula 1 has notoriously struggled to reach younger viewers in the past few years (some through its own doing, admittedly). On Channel 4, you can guarantee crossover with some of their younger skewing shows, notably Gogglebox and TFI Friday. A crossover involving the former is bound to happen and I’d be stunned if it did not materialise. Is Channel 4 guaranteed to get less viewers than ITV for Formula 1? I would say it is likely, but I do not think the difference is as big as some may expect. I should probably whisper this, but the good news I feel about a Channel 4 deal is that they will bring something different to the table. I say whisper it, that is a reference to Whisper Films. For those of you unfamiliar, Whisper Films was set up in 2010 by Jake Humphrey, David Coulthard and Sunil Patel. And who owns an equity stake in Whisper Films? Channel 4. I think you can connect the dots. One thing that probably won’t jump ship is The Chain. Channel 4 will want to create their own identity and I simply do not see that happening. 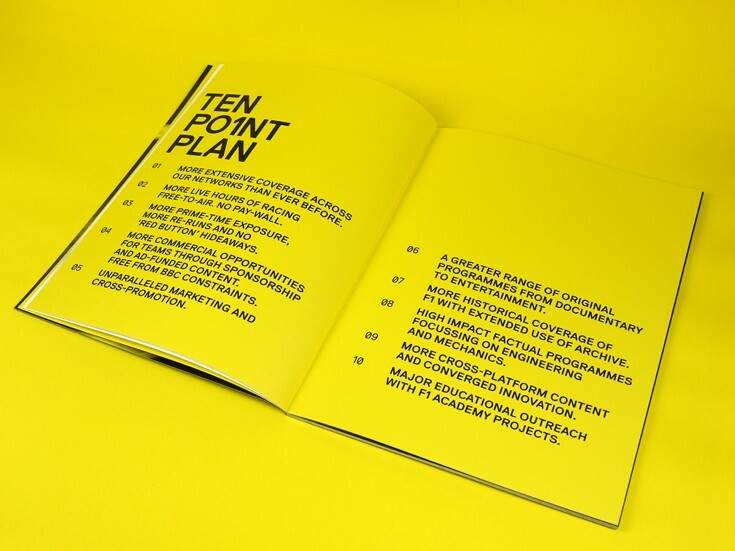 From a scheduling stand-point, Channel 4’s ten point plan from 2011, located above, gives us a great idea about the potential that they could have going forward. I am sure we can all get behind more historical coverage from FOM’s archive and a greater range of programming on the station. Some of the points are no longer relevant, given that Channel 4 are now in a shared deal with Sky Sports, but it is food for thought. My final point would be: don’t judge Channel 4 on what they do or don’t deliver at the 2016 Australian Grand Prix, but judge them on what they do in the latter half of 2016 and 2017. It will already be a logistical squeeze getting everything in place for March 2016, but I am confident Channel 4 can do it. Whaaaaaaaaaaaaat???? There was talk of them needing to SAVE money… There was talk of them not even being able to afford the rights for the Paralympics… How the hell have they done that??? I’m guessing Steven that although the race is ad free the lead up and post race will be ad heavy to pay for it. How much has the BBC had to pay to get out of the contract? (We know Bernie wouldn’t miss a trick!). That’s our money, folks! Will we finally see Gow get the anchor job? Also I wonder if C4 will copy the Beebs production model or go more NBC and have a studio show in the UK with a minimal on site team a la Buxton/Swales. Why would Ch4 want to copy an outdated pathetic model which is the BBC? I didn’t mean copy literally, I just meant go away from the anchor team being on site and using a UK based studio set-up for most of the broadcast. C4, sounds a bit desperate! Big brother, Chelsea and Gogglelbox works so well alongside f1, LOL! Big Brother is on Channel 5. Guess you’ve been living in a cave. Interestingly, during the F1 section of last night’s SPOTY (around 43 mins on iPlayer), it said “Pictures from Whisper Films” and “Pictures from Sky Sports”. Why was BBC Sport footage not used? Presumably, the BBC’s rights had already been cancelled / elapsed / lost by that point and they’ve bypassed FOM (who would have asked for payment) and gone straight to Sky and Whisper/C4 for footage. I think the rights don’t expire until the end of the year. Videos are still up on the website. I think it was more that specific footage of Toto and Lewis etc was from those sources. It seems he didn’t do a special film like the rest of the nominees so it was a case of make do with they could get they showed other F1 content without crediting Sky. Good riddance to the BBC they have only half heartedly covered Formula One for a long time, even longer than this disgraceful public display of they’re ineptitude to apply they’re budget and costs to the real subject of producing decent television as well as radio programmes but instead wasted it on pay-offs to incapable employees. Is this just a guess? I’ve seen nothing to suggest he wont be moving with the rest of the team. Unfortunately, you’re probably true. It’s a shame, he was the only reason i watched any pre race coverage from 2012. Eddie is 68 now, so he’ll probably retire, but if he does make the switch, i’ll be really happy. The Whisper Films connection could actually make this a very good move for F1 fans. DC has always been a great asset for the BBC coverage and it would be excellent to have Jake and DC broadcasting together again. Let’s also hope that Channel 4 can regain full rights for F1 coverage when the current deal ends in 2018 – I, for one, would be delighted to be able to ditch my SkyF1 (or should I say Sky Darts!) subscription! Couldn’t honestly see Jake back and broadcasting full time from F1… he’s got one kid turning three early next year and one arrived this year, which despite what the blog post says, seems to be a pretty powerful reason to take a UK based job… his wife was pregnant with the first when he quit at the end of 2012 and it was the reason he cited for leaving. Didn’t his BT Sport deal have something to do with it?